Free Accelerate Download from FilesPack.com! Slow Internet connection speeds can be frustrating, and the hardware upgrades necessary to speed your system up can get very expensive. Webroot Software offers solutions designed to help you get the most out of your current Internet connection without making costly investments in hardware upgrades. 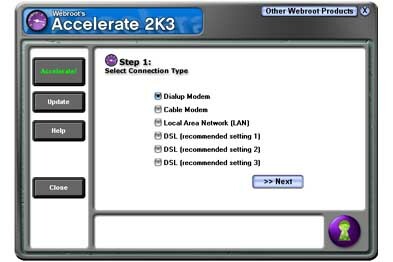 Accelerate is an easy-to-use software program that improves Internet connection speed for dial-up modems, cable modems, DSL, and LAN connections. By default, most modems and network connections in Windows are not configured to transfer data at their maximum or their most efficient speed (e.g 28800, 56KB). While the maximum transfer speed of a modem/network connection can only be changed by costly hardware upgrades, Accelerate optimizes Windows settings for data transfer over modem/network connections resulting in faster download speeds, faster web site loading, and an overall increase in web surfing session speed. Because modem/network settings are unique, Accelerate helps you fine-tune your specific settings to get the best-possible performance out of your current hardware. A user-friendly 'acceleration wizard' guides you through the optimization process, allowing you to choose whether to change settings on your own or follow the recommended changes. You can free download Accelerate 4.0 now.